We believe that our credentials set us apart from other tree care companies in the area. Along with our certifications of Licensed Tree Expert #408, C.A.A Master Arborist #19, ISA Climber Specialist and Certified Treecare Safety Professional, check out the most recent accomplishment our company has to offer our clients: TCIA Accreditation! Tree companies should have a business license that allows them to operate legally in the stat of NJ. 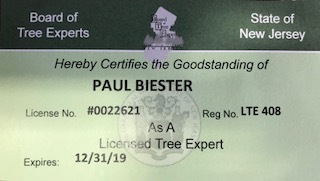 This does not satisfy the requirements of the “Tree Expert and Tree Care Operator’s Licensing Act 45:15c-11.” According to the law passed in April, 2017, a company must be registered with the NJ Board of Certified Tree Experts and employ an LTE (Licensed Tree Expert) or LTCO (Licensed Tree Care Operator) in order to perform tree operations in NJ. The list of services an LTE or LTCO can perform is different. Please visit our blog to see the list. The LTE/LTCO exam/s require a field portion as well as a written test which other licenses may not. It is always a plus when a company employs a “Certified Arborist” thorught the International Society of Arboriculture or ISA. Although a positive, this certification alone does not satisfy the requirements of the law. A tree care company should also carry tree care operations insurance, not just a landscaper rider. Check out https://njtreeexperts.org/ to make sure the company is compliant! Tree Awareness, Inc., a commercial and residential tree care company located in Woolwich Township, NJ, recently became accredited in accordance with tree care company Accreditation standards put forth by the Tree Care Industry Association (TCIA), a trade association of more than 2,200 commercial tree care firms and affiliated companies. TCIA Accreditation is the only program of its kind in the tree care industry. It is a voluntary process evaluating businesses to ensure that professional practices and standards are met by all employees that work on a homeowner’s property. When a homeowner hires an accredited tree care company, they can rest assured that this organization has been checked for proper insurance, applicable licenses, reliable and ethical customer service practices, and meets strict operating standards. A key objective for Accreditation is to help companies provide the highest levels of service to homeowners. As a measure of protection to homeowners, businesses undergo renewal check-ups annually. The annual renewal ensures that the company continues to employ trained professionals, is still properly insured and has a good safety and consumer satisfaction rating. Accredited tree care companies must also re-apply every three years so that their practices can be reviewed and the continuation of best business practices can be verified. The 3-year Accreditation achievement demonstrates that Tree Awareness, Inc. has undergone an extensive review of practices as well as a site visit, and adheres to all accreditation standards. For more information on Tree Care Industry Association Accreditation, visit www.tcia.org.